Dave Gibbons reports back from the NYRR Team Champs, August 5th 2017. In early August, 11 CHRC men and 14 CHRC women set out for the Team Championships 5 mile race. Team champs isn’t like most NYRR races; the men and women run at separate times which gives the team the opportunity to cheer for the other group before or after their race. This year, the men’s race was scheduled for 7:30am. However, the weather threw a wrench in NYRR’s exceptionally meticulous plans as rain and lighting delayed the start to 8:30 am. Despite the heat, humidity, and early rain, both the men and women’s teams came out strong to cheer and run hard. Starting at the 102nd street traverse, the men’s team gathered in the corrals and the women’s team was just ahead to cheer on the start. James B, Spencer, and Guillermo led the men’s team with sub-34 finishes. The course was well supported with cheering stations set up by all of the local clubs. Although the heat and humidity got to some of the runners, our men’s team ran tough and all 11 finished. After the men’s race, the men gathered at the start to cheer on the CHRC women. All 14 CHRC women finished the race. Shivani, Jess, and Carol led the women with sub-40 minute finishes. 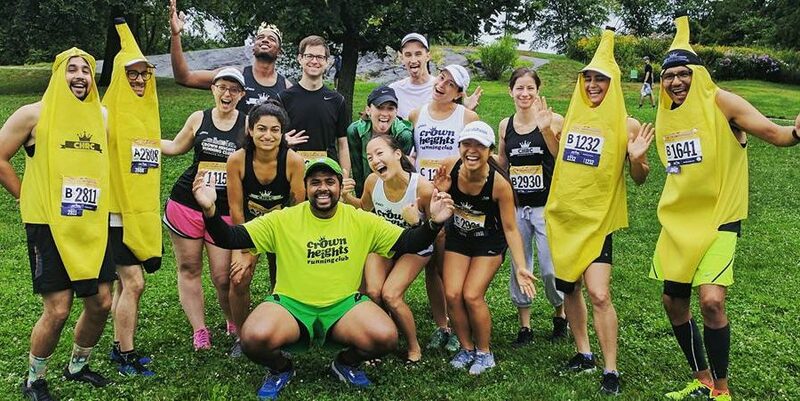 We had three bananas race this year, celebrating our one-year anniversary of debuting the CHRC banana suits in a NYRR race. Spencer, Guillermo, and Gideon toughed it out in the heat to represent our club in full banana flair. Given the heat and humidity, this race wasn’t ideal for a lot of PRs, but some runners were able to set a new personal best for the 5 mile distance. Other runners, who were in the middle of marathon training and taking it easy or battling injuries, still put their best foot forward to represent CHRC. It’s exciting to see our club getting bigger and more people training hard for the upcoming fall marathon season. We’re looking forward to seeing the results.